Chaste Berry is a traditional herbal remedy derived from the fruit of Vitex agnus castus, a shrub which grows in temperate regions of Asia. In ancient times it was a symbol of chastity, hence its common name, the chaste berry tree. Chaste Berry (Vitex) Extract has been researched due to its reputation for supporting healthy female hormonal levels during menopause. This standardized formula contains a minimum of 0.5% Agnusides, the active component of Chaste Berry, as well as Dong Quai for synergism and additional hormonal support. Vitex nourishes and supports the endocrine system to find its own balance, by stimulating and normalizing the pituitary gland, which regulates the balance of estrogen and progesterone in the body. It is helpful for many of the symptoms of PMS, including cramps, headaches, depression, water retention, acne, breast tenderness, and irritability. It can also help to normalize irregular or scanty periods. 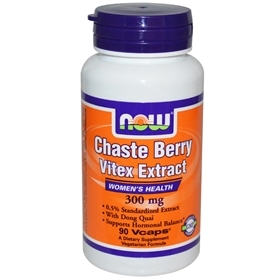 Chaste Berry Vitex has benefits to women who are menopausal. It helps to relieve many of the uncomfortable symptoms, such as hot flashes, irregular cycles, depression, moodiness . It is also a valuable remedy for women with uterine fibroids, fibrocystic breasts, or endometriosis, since it has the effect of enhancing progesterone and decreasing estrogen levels, and these conditions thrive under the influence of estrogen and shrink under the influence of progesterone. Suggested Usage: As a dietary supplement, take 1 Vcap® 2 to 3 times daily with water or food. Consider taking this product in combination with NOW® Soy Isoflavones and Standardized Red Clover/Black Cohosh. Other Ingredients: Cellulose (capsule), Maltodextrin, Magnesium Stearate (vegetable source) and Silica. Contains wheat derivative. Contains no: salt, yeast, soy, milk, egg, shellfish or preservatives. Vegetarian/Vegan Product.